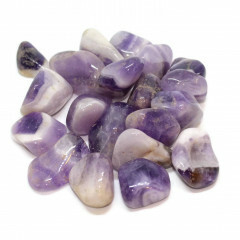 We sell a variety of sizes of Amethyst tumblestones, in different packet sizes, from a single stone to a bulk packet. For a list of our Amethyst products, and a lot more information about the gemstone itself, please see our ‘Amethyst’ page – we offer a range of products including tumblestones, cut and polished stones, and even rough pieces. 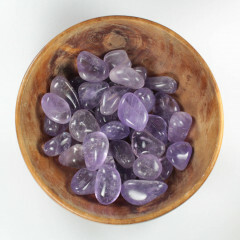 We also offer some information about the stone itself, and the crystal healing benefits it is meant to bestow. Simply put, tumblestones are a small stone which has been polished in a rotary rock tumbler – essentially, rough stones are placed in a spinning barrel with varying grades of abrasive powder, in order to form them into a highly polished pebble. Typically speaking, the entire process takes 3 – 5 weeks – there are several steps in the tumbling process, involving different grades of abrasive, which are usually run for around a week each. They come out as a finely polished small stone – very smooth, and great as a decoration or for holding. Some of the stone is lost, of course, so typically the lower priced or lower grade stones are used for tumbling, rather than the more expensive gemstones, which may be sold cut.